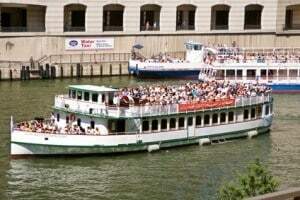 Sightseeing boat tours are a primary attraction that makes the Chicago area a thriving destination for tourists and visitors alike. Individuals visiting the area enjoy marine recreation including leisurely sightseeing opportunities to view many of the hotspots in the region. Chicago is known for its many architectural sites with over 50 historic buildings in the area, which are best experienced from riding the waters of the Chicago River. However, the waters along the Chicago River and other waterways in the area including Lake Michigan often experience high levels of traffic and poor weather conditions. As a result, all vessels including sightseeing boats (such as: Shoreline Sightseeing, Wendella Boat Tours, or Odyssey Cruises) are put at great risk of having an accident with other boats, docks, peers, buoys and other objects in the water. Because of that, many visitors that have suffered injury in a vessel accident will hire a Chicago sightseeing boat tour accident attorney to handle a claim against the responsible party. Passengers and Tourists – Every individual traveling on a vessel is protected by state of Illinois and civil tort laws. Any passenger or tourist suffering injuries or wrongful death during the Chicago area excursion is entitled to file a lawsuit against every responsible party for damages. Workers and Crewmembers – Federal and Illinois state law protects shipyard and dockyard workers, along with crewmembers under U.S. federal maritime law. Protection under the Jones Act, entitles every maritime employee the right to receive financial compensation for injuries suffered and lost wages from missed work caused by the accident. Every tourist or passenger on a sightseeing vessel in the Chicago area is entitled to receive financial compensation if involved in a sightseeing excursion accident caused by the negligence or recklessness of the staff. This is because the operator of any water vessel is required by law to maintain a specific level of safety. Maintaining safety includes issuing a flotation device to each passenger traveling on board, or indicating clearly where the gear can be located on the boat. It is also the duty of the boat owner to maintain the vessel to ensure that it is “seaworthy” and in proper working order at all times. In addition, the boat’s captain has a legal obligation to provide safe navigation of their vessel, never placing passengers and tourists at unnecessary risk. This means that all crewmembers on board need to ensure that every tourist is properly equipped. In addition, crewmembers must be trained properly to use dangerous or specialized equipment, to minimize the potential of injury or accident to everyone on board or sharing the same waters. Any crewmember that is injured by a tourist sightseeing accident also has legal recourse to recoup damages. The sightseeing boat operator must properly service and maintain the vessel. It is also the boat operator’s duty to ensure that all crewmembers work reasonable hours. This will minimize worker fatigue to ensure a level of safety to everyone on board. The owner of the vessel has a legal opportunity to provide an adequate margin of safety to every crewmember. Anytime the vessel owner is negligent in their actions or inactions concerning a sightseeing boat tour accident, they can be held legally liable for any injury or fatality caused by negligence, carelessness or recklessness. Any tourist or visitor suffering serious injuries caused by a sightseeing excursion needs to contact an experienced Chicago sightseeing boat tour accident attorney. The season law firm will dispatch investigators, gather police reports, collect witness statements, secure evidence and take photographs to ensure successful financial recovery. Rosenfeld Injury Lawyers LLC at (888) 424-5757 handle all types of Illinois boating accidents. Their clients include shipyard and dockyard workers, boat crews, passengers, tourists and captains injured on a vessel through the negligence of another. The law firm takes boating accident cases on a contingency fee basis. This means that all payment for legal services are paid from an out-of-court settlement or an award at trial.